Why is that sun not smiling? Does it not know that within its folds it contains a dozen delicious tortillas? 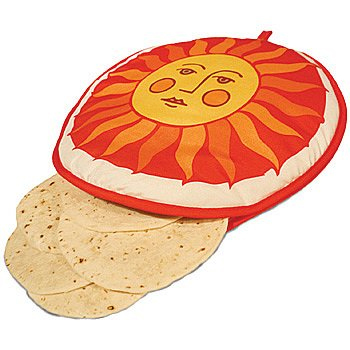 Perhaps that is the issue with this Sunny Tortilla Warmer . It doesn’t want to share! A good grill session requires one additional element aside from the fire and the food: relaxing! After the food is arranged, it’s time to kick back and enjoy the moment. 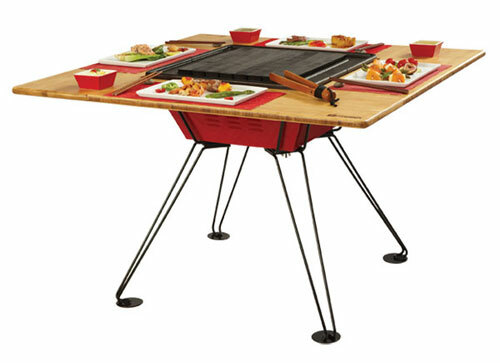 Considering that the the new Shinwa Grill is a combination grill and dinner table, about the only question that would remain would be who is going to get up to get the beer? Keep reading for the press release and a link to the website. Maybe they package the Shinwa Grill with a beer cooler. Feet normally aren’t supposed to be on the table. Same goes for footwear. 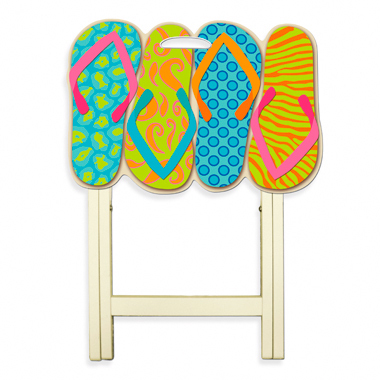 However, the rules of etiquette are a little different down by the beach, and the same goes for this Flip Flops TV Tray. With all the bright crazy colors going on, nobody is going to mind if you kick up your kicks for a little slow-down relaxing. Besides, with those zany patterns all over the table top, who is going to notice? Best to pick up two so as to have a matched set. Since the dawn of petkind, mankind has been looking for a way to keep our furry friends from begging for scraps at the dinner table. It’s about time the human race has figured out that it’s an unwinnable battle. However, there is a solution that both saves face, and gives our adorable little critter friends that which they most desire: a seat at the dinner table. 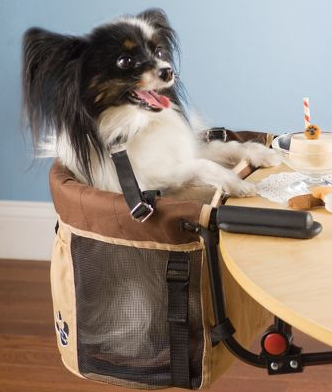 The Pet High Chair, available at Hammacher Schlemmer, lets you and your pet share a meal while seeing eye to eye. The adjustable chair clips on to tables that are up to 2-inches thick, while the 600-denier tan and brown nylon fabric comfortably holds your dinner companion in place. As for the unexpected eventual attempt to dash across the dinner table to help you lick your plate clean, the chair comes equipped with two tethers to help keep dinner as refined as possible. 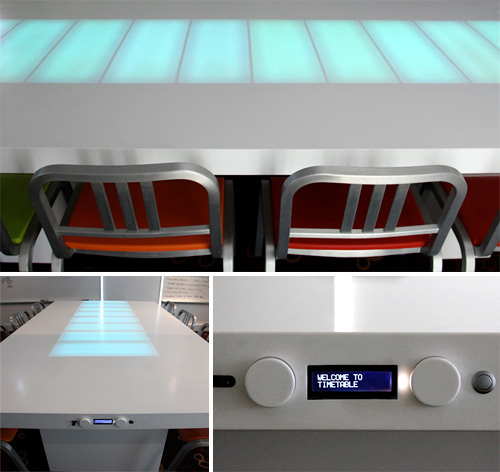 The Timetable may have been invented as a means to improve efficiency in the office, but this productivity-enforcing table could change the way we eat. Salad is an excellent accompaniment to almost any meal. Problem is, big, leafy greens take up a lot of room. After all, salad bowls are big for a reason; they require a large footprint to hold all that greenery. As such, often the salad bowl gets left behind, while the other, less healthy courses get the limelight of the tabletop. 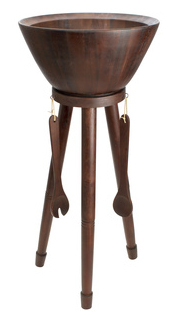 The Dark Acacia-Wood Salad Bowl with Stand Set allows for the salad to stand alone, saving valuable tabletop real estate for other entrées. The 28.5-inch stand compliments the 8-inch by 16-inch bowl, and placed next to the table, the set is an attractive and easy-to-reach option for smaller dining tables. With this salad bowl at your tableside, the roast beef and mashed potatoes are just going to have to learn how to share top billing.